Anyone who has had the joy of bathing a baby can relate to the aches and pains bending over a bathtub creates. In fact, when my babies were newborn, I would bathe them in the sink so I didn’t have to put that type of strain on my body. Had I had the CharliChair back then, I imagine bath time would have been more enjoyable for me, and my babies. The CharliChair was designed with the parent and baby in mind. Once out of the box, assembling the chair was extremely easy and quick. It has no-slip grips on the bottom and has been created to fit in most bathtubs and standing showers. The CharliChair is made for babies 0 to 2 years old. If used from birth, babies will become comfortable in it as they grow older. I think the best benefit the CharliChair offers is the ability to reduce stress during bath times for families with disabled children. As babies begin to grow and gain weight, certain tasks become more complicated. My friend has a beautiful 10-month-old baby girl with down syndrome. I brought the CharliChair to her in hopes that it would enhance bath time for their family. One of the first things my friend liked about the CharliChair was the flexible seat reclining. Adjustable from a side spindle that locks into place, the seat can be adjusted to the ideal position for the baby. This feature allows for proper support to be given to the baby, no matter what age or weight they are. Another thing that she liked about it was the relief her back and joints felt during and after bathing her daughter. There was no uncomfortable kneeling or leaning awkwardly over the bathtub wall. She set the height of the chair to the desired level for her comfort and effortlessly bathed her baby. When using the CharliChair, having a removable showerhead really makes bathing more effective. My friend did not have a removable showerhead when using the chair. She would get water from the bathtub faucet to clean her baby. 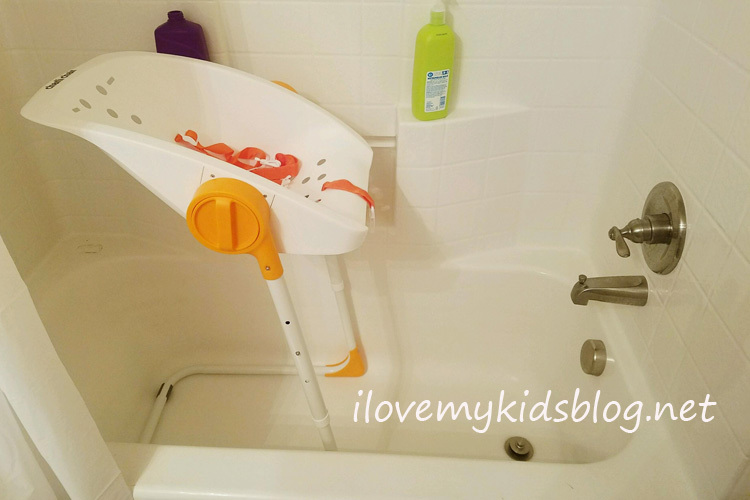 Because the chair drains water as it hits the chair, it caused her baby to become a little cold towards the end of the bath. With the use of a removable showerhead the baby’s body can stay warm and be rinsed off quicker. I did a little research and found out that there is a new CharliChair designed by the same company. The CharliChair 2-in-1 allows water to stay in the seat for easy bathing. If you do not have a removable showerhead, this chair may be a better fit for your baby. The straps used to help support the baby while being bathed did not seem to offer comfortable security. It does feature a 5-point harness and has passed national safety regulation; however, the straps were setup as tight as they could be and the baby still slithered down in the seat by the time the bath was done. For younger babies, the straps offer virtually no purpose because they are so loose. The straps are intended to be a little loose for ease in washing the baby all over. It should be expected to have them more loose than tight. It would be great to have more versatility in the straps, so that they can be tighten more during the younger months of infancy. CharliChair does have a chair pad that can be purchased separately. It is a thick material that keeps the baby more supported. It adds more height between the chair and baby, giving the baby a small boost up. 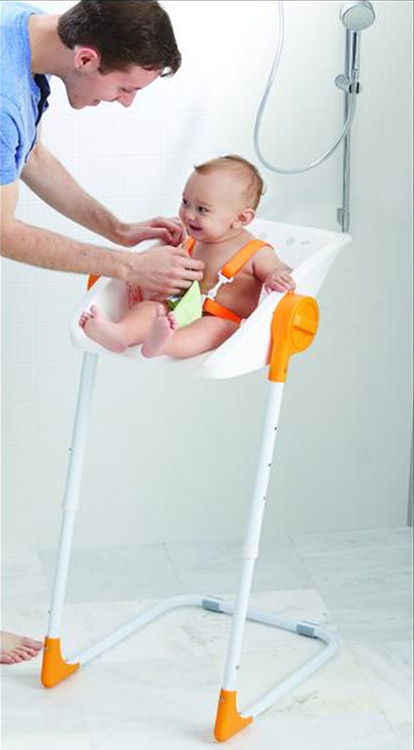 This could help the straps seem more tight and prevent the baby from sliding down during bath time. I believe the CharliChair is a great item to have in the home. It is ideal if you have a child with disabilities or only have a walk-in shower. The design and purpose are good, but you may find it is not necessary for your lifestyle. CharliChair can be purchased at Primo Baby and other baby retail shops.